The Pittsburgh Steelers and Atlanta Falcons both had 5-3 records and were riding four-game winning streaks as they faced each other on November 10, 2002. 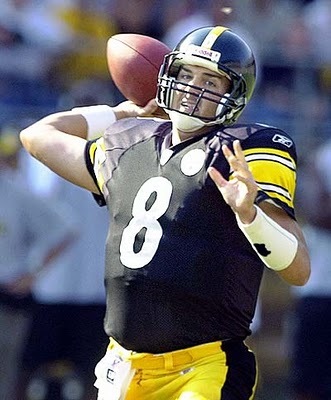 For the Steelers, Head Coach Bill Cowher had made a significant move in replacing starting QB Kordell Stewart with Tommy Maddox (pictured above) and it was paying off in a big way. Maddox, a first round draft choice for the Broncos in 1992, had been a major disappointment, lasting just two years in Denver before bouncing to the Rams, Giants, Falcons, Arena Football League, and XFL. He led the Los Angeles Xtreme to the XFL title in 2001 and parlayed that success into a return to the NFL. 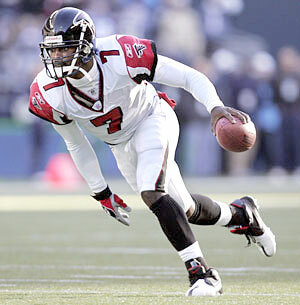 Atlanta, coached by Dan Reeves, had second-year QB Michael Vick in his first full season in the starting job. His running ability and strong left arm were assets, but he had plenty of rough edges and was very much a work in progress. RB Warrick Dunn provided versatility out of the backfield. There was a crowd of 62,779 in attendance at Heinz Field. The Steelers had the first possession of the game and punted. Starting at their 20, the Falcons drove into Pittsburgh territory with Dunn running effectively and Vick completing four straight passes. But Vick fumbled and LB Joey Porter recovered and returned the ball to midfield. 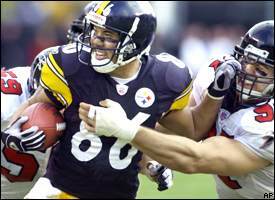 Three plays later, Maddox threw to WR Antwaan Randle-El for a 36-yard gain in a third-and-sixteen situation and a 20-yard completion to WR Hines Ward (pictured below) got the ball to the Atlanta four yard line. But now it was Maddox fumbling and LB Keith Brooking recovered to end the threat. Following a punt by the Falcons, Todd Peterson kicked a 34-yard field goal with nine seconds remaining in the opening period to give the Steelers the lead. Atlanta started off the second quarter by driving 77 yards in four plays to get on the board. Vick threw to WR Shawn Jefferson for a 43-yard TD and, with the successful PAT, it was 7-3. Pittsburgh responded with a scoring drive of its own, with Maddox successful on four passes and RB Amos Zereoue gaining 23 yards on the ground. WR Plaxico Burress caught a pass from Maddox for a 33-yard touchdown. The Steelers drove to another TD following a short series for the Falcons. Maddox went to Burress for 32 yards on first down, Ward went 29 yards on an end-around play, and after an incomplete pass Maddox passed to Ward for a five-yard touchdown and 17-7 lead. The teams traded punts until Pittsburgh mounted an eight-yard series but Peterson’s 40-yard field goal attempt was unsuccessful to end the first half. Down by ten points, Atlanta started off the third quarter with an 80-yard scoring drive that culminated in Dunn running up the middle for a 59-yard touchdown. The Steelers came right back, however, with Maddox throwing to Burress for a 62-yard TD. The extra point attempt was no good and the score remained at 23-14 in Pittsburgh’s favor. Atlanta’s next series was highlighted by two long third down conversions. In a third-and-22 situation, Vick completed a pass to WR Brian Finneran for 23 yards and shortly thereafter, backed up by a penalty that made for a third-and-23 play, he completed a pass to WR Trevor Gaylor for 27 yards to the Pittsburgh 21. The 11-play, 48-yard possession ended with Jay Feely kicking a 36-yard field goal to narrow the Steelers’ lead to six points. Once again Pittsburgh responded by putting points on the board. Maddox completed a seven-play, 67-yard drive by throwing to Ward for 10 yards, Burress for 20, and then 18 yards for a touchdown to TE Jerame Tuman. It was 31-17 heading into the fourth quarter. A fumble late in the third quarter had given the Steelers good field position at the Atlanta 37 and they drove to a Peterson field goal, this time from 34 yards early in the final period. The Falcons had to punt following their next possession but a fumble on the return by Randle El was recovered by LB Mark Simoneau and gave Atlanta the ball back at the Pittsburgh 37. Atlanta made the most of it, with FB Bob Christian scoring a touchdown from a yard out five plays later. It was now a ten-point game, with Pittsburgh’s lead cut to 34-24. The Steelers went three-and-out on their next series and a punt by Josh Miller was returned 18 yards by CB Allen Rossum to the Atlanta 35. Backing themselves up with penalties, the Falcons got a first down on a Vick pass to Dunn that picked up 16 yards. Later, in a third-and-nine situation, Vick threw to TE Alge Crumpler for 21 yards. The biggest play of all came when, on third-and-24 at their own 43, Vick went to Jefferson for a 35-yard gain. The Falcons could get no further and Feely booted a 40-yard field goal. Once again the Steelers had to punt and, thanks to another fine return by Rossum of 34 yards, Atlanta took over at midfield with just under two minutes remaining in regulation. Vick threw back-to-back passes to Jefferson that picked up a total of 27 yards. Two plays later and facing third-and-three, the quick-footed quarterback ran for seven yards. Finally, on the sixth play of the series and with less than a minute remaining, Vick took off on a broken play for an 11-yard touchdown. Feely’s all-important extra point attempt was successful and the game was tied. There was still time for the Steelers to respond but the clock ran out for them at the Atlanta 37 and the contest went into overtime. Pittsburgh had the first possession and drove to the Atlanta 30, with the key play being a 30-yard pass completion from Maddox to Ward. But Peterson’s 48-yard field goal attempt was blocked when Finneran, who had never played on special teams before, got a hand on it. After a short possession by the Falcons, the Steelers again advanced into Atlanta territory. They kept the ball on the ground with Zeroue carrying, except for a 24-yard pickup on a pass from Maddox to Burress. But after the drive stalled at the 33 yard line, the Steelers punted. The Falcons again punted in turn and, three plays later, Maddox was intercepted by CB Kevin Mathis to give Atlanta good field position at the Pittsburgh 44. The Falcons were only able to pick up six yards and, with time running out in the extra period, Feely attempted a 56-yard field goal that was blocked. From the Pittsburgh 49 the Steelers had just one second to work with. Maddox threw a long “Hail Mary” pass to Burress who gathered it in at the one for a 50-yard gain but couldn’t manage to fall into the end zone. For the first time in five years, a NFL game ended in a tie by the score of 34-34. The Steelers gained a whopping 645 total yards, to 447 for Atlanta. Pittsburgh also had more first downs (30 to 21). The Steelers also turned the ball over three times, to two turnovers by the Falcons, although Atlanta was penalized 11 times, against four flags thrown on the home team. Tommy Maddox completed 28 of 41 passes for a then-team-record 473 yards and four touchdowns with one intercepted. Plaxico Burress (pictured at right) also set a franchise high with his 253 yards on 9 catches that included two TDs. Hines Ward added 11 pass receptions for 139 yards and a score. Amos Zereoue rushed for 123 yards on 37 carries. For the Falcons, Michael Vick was successful on 24 of 46 throws for 294 yards and a TD with none intercepted, although he was sacked four times and twice was called for intentional grounding. He gained 38 yards on 10 carries with one touchdown. Warrick Dunn gained 129 yards on 20 rushing attempts and scored a TD. Shawn Jefferson topped the receivers with 9 catches for 131 yards and a score. The Steelers lost the next week but recovered to win five of six games to close out the regular season atop the AFC North at 10-5-1. They defeated the division-rival Browns in the Wild Card round before losing to Tennessee in overtime at the Divisional level. Atlanta won three straight following the tie before slumping, but finished second in the NFC South and qualified for the postseason as a Wild Card. They stunned the Packers in the Wild Card round before losing their Divisional playoff game at Philadelphia. Tommy Maddox suffered a spinal chord injury the next week at Tennessee that, amazingly considering the apparent severity at the time, cost him only two games. Overall he completed 62.1 percent of his passes for 2836 yards and 20 touchdowns with 16 interceptions. Maddox received Comeback Player of the Year honors from the Associated Press and Pro Football Writers. 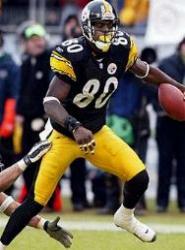 Plaxico Burress caught 78 passes for 1325 yards (17.0 avg.) and seven TDs. Hines Ward earned selection to the Pro Bowl by pulling in 112 passes for 1329 yards (11.9 avg.) and 12 touchdowns. Michael Vick (pictured below) also was selected to the Pro Bowl for the first time, passing for 2936 yards with 16 TDs and 8 interceptions and rushing for 777 yards and eight scores. Warrick Dunn topped the Falcons in rushing with 927 yards and caught 50 passes for 377 more. Brian Finneran ended up as the team’s top receiver with 56 catches for 838 yards (15.0 avg. ).